The Randolph Library opened in 1964 in this renovated garden center on Millbrook Avenue. 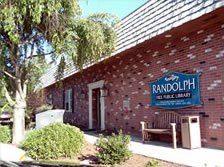 In 1962 a group of Randolph residents met to discuss the founding of a community library. Uncertain that the idea would garner enough support, the group sought the assistance of local social, service, and religious organizations. Interest in the project grew, and when the first contribution was received from Herbert H. Hirschhorn, a former resident, the library was incorporated. In 1964 a building for the library was found, the former Home and Garden Nursery, now the Artworks Studio. Library volunteers negotiated the sale, signed for a mortgage, and acquired the ten-acre property. Residents donated books, volunteers painted and built shelves, and the library opened on June 20, 1964. 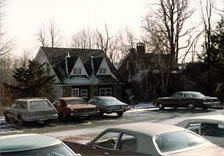 In 1985 the library moved to larger quarters in the renovated restaurant of the former Ackerman’s Hotel on Calais Road. An addition to the children’s room became a reality in June of 1999 after many fundraising events, including an art auction, book sales and the “Paint-a-Tile” program. To celebrate Randolph’s 200th birthday in 2005, the library sponsored a petting zoo at the country fair and commissioned a quilt with the theme “What I Like About Randolph.” The Black River Piecemakers designed and prepared the materials for the creation of Randolph’s “Bicentennial Quilt.” Residents of all ages drew on fabric squares using pastel fabric crayons. During two work sessions, a total of fifty-six squares were created. 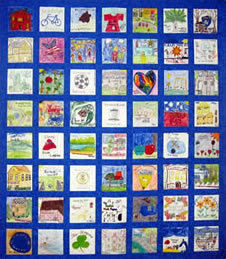 The squares of the quilt depict images in Randolph that range from the township’s historic sites and schools to its recreation and leisure activities. The Teen Zone opened in 2009. In 2009 the newly-renovated Teen Zone opened for business, featuring comfortable seating in custom banquettes as well as bistro stools and tables. Materials for teen users, ages 12-19, filled the shelves. Five Dell computers with widescreen monitors and a networked laser printer could be used for school assignments. A flat screen TV doubled as a computer monitor for group projects.